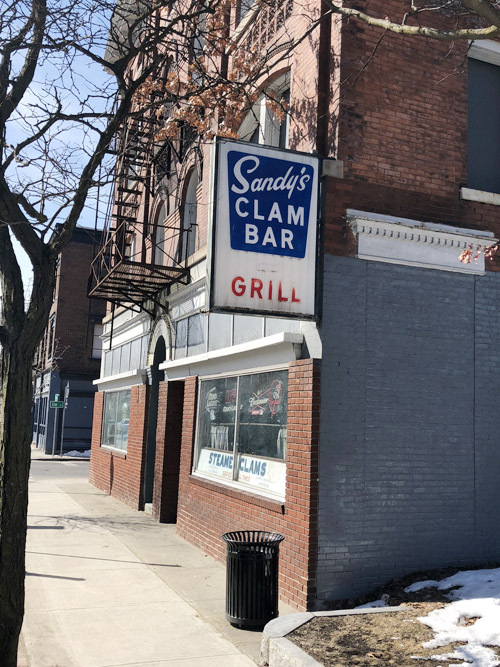 Saratoga-based developer Sonny Bonacio, who built the $26-million 14 Hudson mixed use project in downtown Glens Falls and has said he planned to do another project here, is under contract to buy the former Sandy’s Clam Bar building at 41 South Street, The Chronicle has learned. Mr. Bonacio had not returned email and phone messages by press time. Mark Levack of Levack Real Estate, who had the building listing, declined comment as did Glens Falls Mayor Dan Hall. But sources insisting on anonymity confirmed Mr. Bonacio as the buyer. The vacant Sandy’s Clam Bar building is situated at the northeast corner of South and Elm Streets. It is not part of the $10-million Downtown Revitalization Initiative focused on South Street, but it sits among several City-owned properties that are being packaged in a Request for Qualifications that will be sent to developers. Those properties include the municipal parking lot next door to the Sandy’s Building, the former Hot Shots building across Elm Street, the former Juicin’ Jar and OTB buildings to its west, and the white building at 36 Elm Street once envisioned as a business incubator that never happened. The current open air Farmers Market on the city parking lot next to Sandy’s is to give way to a planned year-round farmers market building a block to the west on South Street. Mr. Bartholomew said the City “is in the process of completing certain environmental studies” of the Hot Shots and incubator buildings, and that reviews will be completed shortly on the former Juicin’ Jar building at 49 South Street and the former OTB building next door. He said both those buildings will be demolished. The 9,300-square-foot Sandy’s building was last listed for sale for $450,000.